If you are looking for an amazing, beautiful, colorful, spiritual energy necklace, my friend Rosey Lowry in the United Kingdom, makes them! 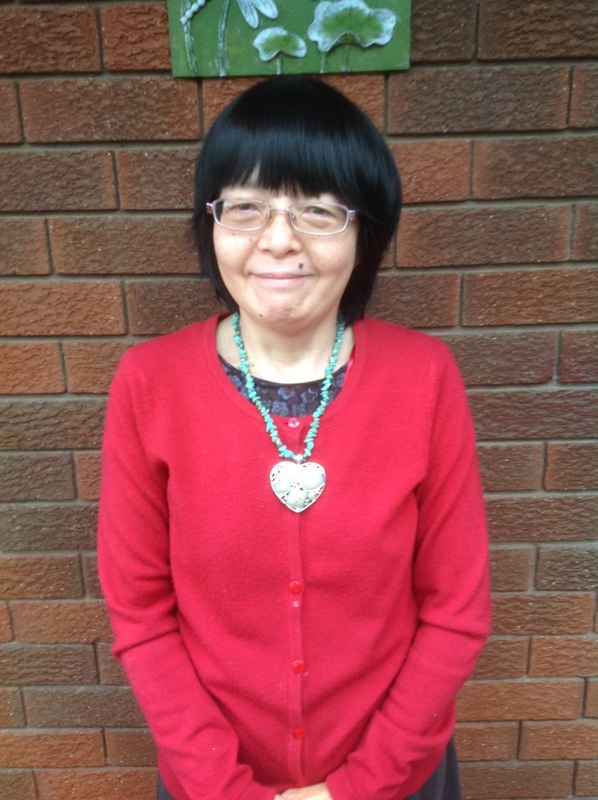 Head over to Rosey’s Etsy store, to see a huge range of wonderful bracelets and necklaces, uniquely designed and created by Rosey – link below. Some of the profits will go into research into ME/CFS (Myalgic Encephalomyelitis / Chronic Fatigue Syndrome). 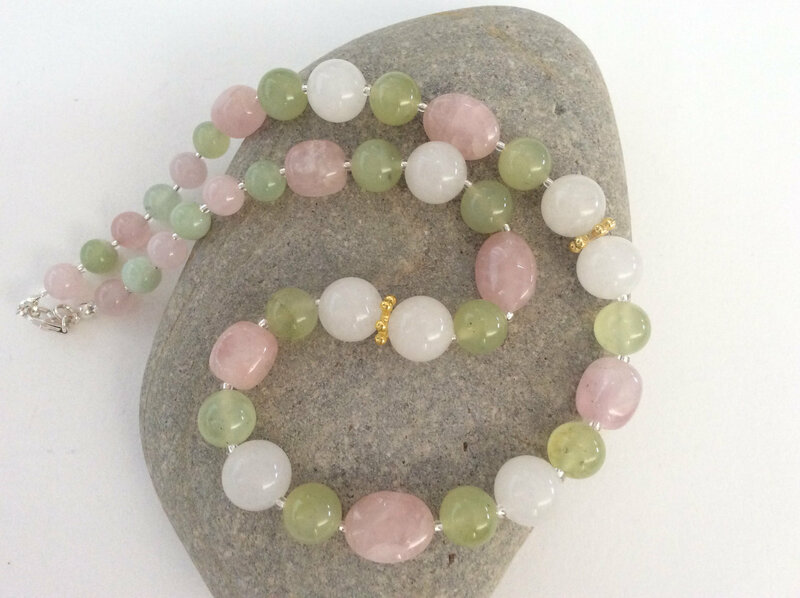 Rosey’s necklaces are divine and give the wearer a peace and reassurance that comes from the metaphysical properties of the crystals she uses, and from the skilful and artful way in which she puts the necklaces together! I know because I own 2 of Rosey’s necklaces! This one has 12mm snow quartz quartz, 10mm and 8mm green jade, 12mm 10mm 8mm rose quartz nuggets, and gold plated snowflake beads, with 925 sterling silver clasp and findings. I count myself blessed to have found and bought this beauty. 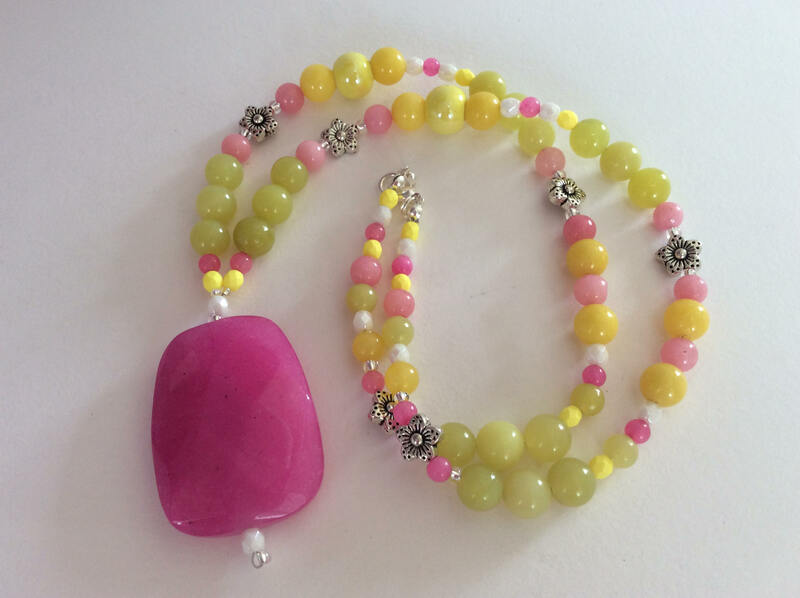 My favorite necklace among all of my vast collection of necklaces (as I love bead necklaces) is the lemon, lime jade with the fuchsia pink focal bead. I wear this to work every Monday, and it brightens up my day. This pretty creation kick-starts my week, and gets praise and attention from on-lookers. Specifications follow. Categories: Art, Beauty, Crafts, crystals, Gemstones, Handicrafts, Jewellery, Recreation, Spiritual | Tags: bracelets, etsy, jewellery, jewelry, necklaces | Permalink. Categories: Peace, Spiritual, Symbols | Tags: blissfully free, energy alert, energy forecast, october energies, sarah shepherd, spiritual shifts | Permalink. Have I mentioned that I love pretty things and bling?? Well, my latest brooch is this magnificent ice blue, amber and jonquil yellow floral brooch, fit for a bride or a bridesmaid or ….. for me ! The photo was taken off me today out-doors on an overcast rainy day, as we’re heading into winter here “Down Under”. 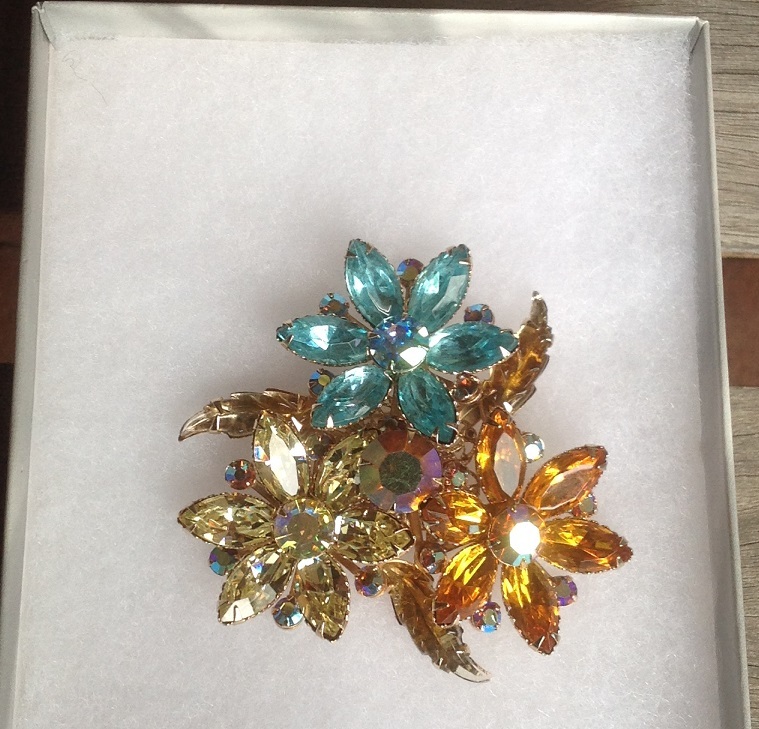 I plan to wear this beauty in the office with my blue jumpers and look forward to looking gorgeous and showing off this amazing flower brooch. Matthew’s love for all things vintage certainly shows through his wonderful products that he offers for purchase, and at the time of posting this, he has a Sale! 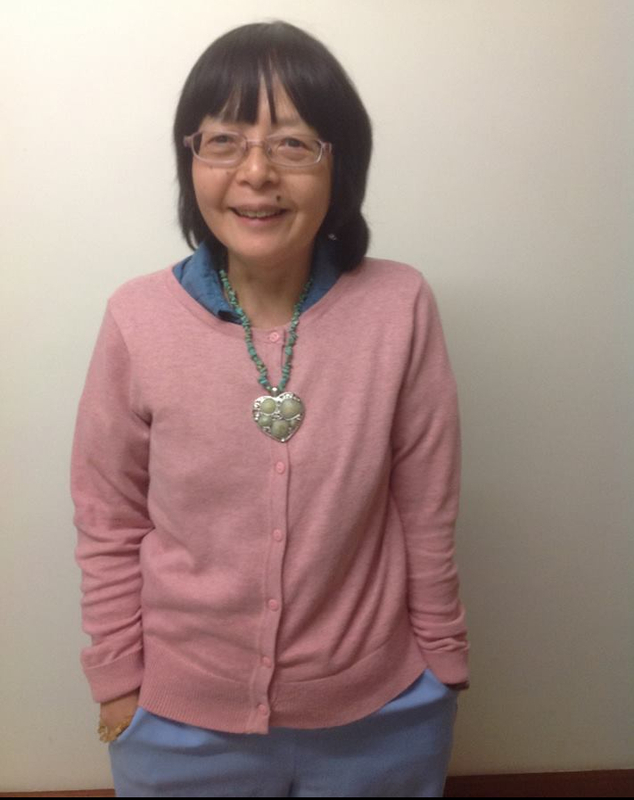 I was truly astonished to also receive a FREE gift of this gorgeous necklace with my brooch. I’ve worn it every day to work and had people admire and comment upon it. It was just right for me when I got it – amazonite stone chips for communication – and a large heart which reminds me to act from the heart. It’s uncanny that Matthew selected it for me, as something he thought I would find delightful – which I do. Please visit FROM THE VANITY now for a delicious jewelry treat for yourself and / or a loved one. The range is wonderful and the prices are good, you won’t be disappointed. Thank you Matthew. A more recent photo shown below. Categories: Handicrafts, Jewellery, Personal, Recreation, Spiritual | Tags: brooch, etsy, jewelry, necklace, vintage | Permalink. I found some wonderful amazing little gems. I love my baby crystal grids from the Little Gems Metaphysical store of Mira Healy, Australia. If you pop into Mira’s online store, you will find crystals, grids, mojo bags and even a crystal singing pyramid and a darbuka dream, which I can well imagine me playing! 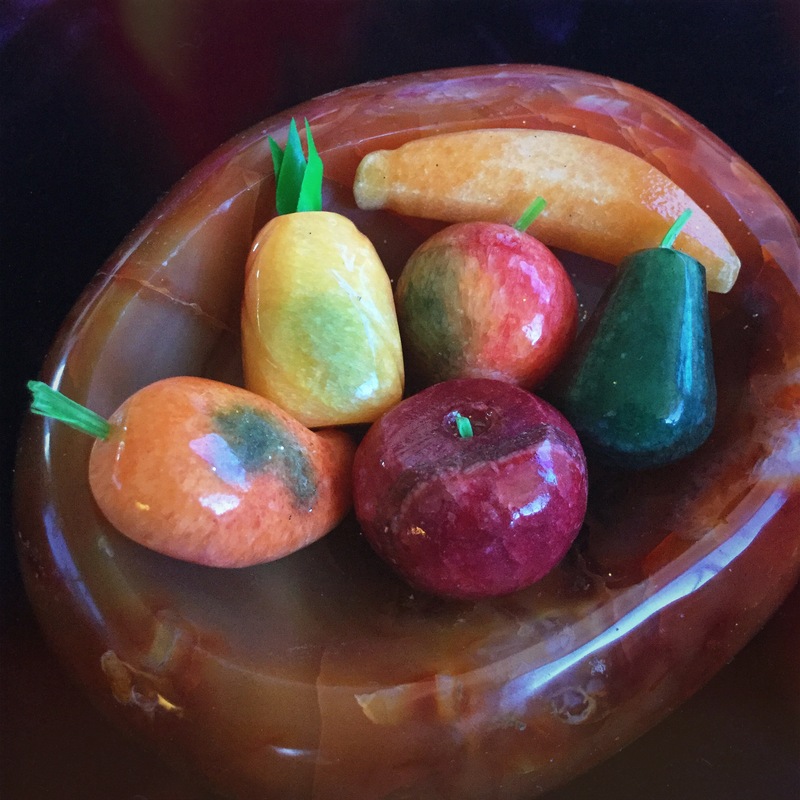 If you are on Facebook, head over to Mira’s Little Gems Metaphysical Store where there are uplifting honest posts and delectable gemstone treats to feast your eyes on. A few weeks ago I bought a baby or mini grid with amethyst and rose quartz – at the time of posting this, please see the pink & blue Baby Grid at Mira’s Etsy store here (link to Mira’s Etsy store below) – it’s the Baby Grid for Travelers. I love it and was thrilled and very grateful that Mira sent me some teeny citrine pieces also. You can see the citrine grid in the photo above, which I have close by me in my lounge room at all times. The box is small at 10 cm square but this is very handy for small places and for travel. My favourite crystal is amethyst as it gives me feelings of calm, peace and love, but lately I have been really drawn to citrine. I also bought the Crop Circle grid. The Baby Grid in pink and blue is really functional as the Flower of Life design is on the lid of the small box. Inside the small box are a cute mini candle, the crystals safely in a plastic sealed bag and some lovely dried lavender, as well as a see through bag to carry the crystals in. I can report that I get a lovely healthy soothing happy feeling when I visit Mira’s three sites, and use her crystal grids. If you’re an Aussie, there is probably something for you from the Little Gems Metaphysical store. Mira is very prompt and friendly and a very nice spiritual person. Thank you Little Gems Mira. Categories: Gemstones, New Age, Peace, Personal, Spiritual | Tags: amethyst, citrine, crystal grids, crystals, gems | Permalink. I love this song, do you? Categories: Culture, Entertainment, Music, Peace, Spiritual, Symbols | Tags: carrie underwood, do you hear what i hear, music, psalm, song | Permalink. Click here for a wonderful range of high quality beautiful crystals, and a Blog with a wealth of information about crystals. I have been buying crystals for a while now from Sage Goddess in California U.S.A. and they have brought alot of joy, comfort and beauty into my Life. I am in the Sage Goddess affiliate programme, so if you make a purchase within 24 hours of clicking on the Link provided at the top of this post, it will help me. Sage Goddess also has delightful perfumes. Thank you! Categories: Crafts, Culture, Gemstones, Jewellery, Perfume, Recreation, Spiritual, Symbols, Traditions | Tags: crystals, gems, gemstones, perfume, sage goddess | Permalink.